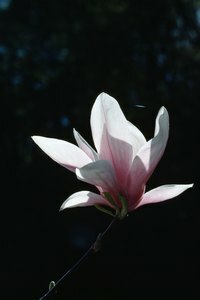 Magnolia (Magnolia spp.) is a genus of trees and shrubs that includes 120 species and even more cultivated varieties. The plants' flowers are usually fragrant, though the intensity of the scent varies according to species. Magnolia fragrance is most often described as citruslike or lemony. In some species, the twigs and branches are also fragrant or aromatic with lemon overtones. Southern magnolia (Magnolia grandiflora), bears large, lemon-scented flowers. Hardy in U.S. Department of Agriculture (USDA) plant hardiness zones 7 through 9, southern magnolia's scent is most apparent when it flowers in late spring. A mature tree may be 60 to 80 feet tall with its hundreds of blossoms perfuming the air. The scent also may present itself late in the growing season as the tree produces sporadic blooms in summer and early fall. The cultivar "Little Gem" (Magnolia grandiflora "Little Gem") features the same lemony floral perfume, and it is a continuously blooming tree that grows 30 feet tall. An early blooming magnolia also renowned for fragrance is the Yulan magnolia (Magnolia denudata). Hardy in USDA zones 6 through 9, it flowers in early spring, setting large quantities of sweet, lemony scented blooms even in light shade. Because of its flower output, Yulan is among the most fragrant magnolia species. It grows 30 to 40 feet tall. Flowers on the Yulan species tree are white, but varieties such as Purpurascens (Magnolia denudata var. purpurascens) feature flower petals that are rose on the outside and paler pink inside. Anise magnolia (Magnolia salicifolia), hardy in USDA zones 4 through 7, provides something a little different in the fragrance department. As might be inferred from its name, the flowers of anise magnolia have an sweet anise or licorice scent. The flowers are white or tinted slightly pink. The tree is relatively narrow and grows 20 to 30 feet tall. When bruised or crushed, its stems also have a distinctive fragrance with anise overtones. The "Van Veen Form" variety (Magnolia salicifolia "Van Veen Form") has an exceptionally good fragrance, according to Michael A. Dirr in his book "Manual of Woody Landscape Plants." Saucer magnolia (Magnolia x soulangeana) is a hybrid with white petals flushed in shades ranging from pink to deep rose or purple. It features lemon-scented flowers and stems that exude a similar fragrance when crushed. Saucer magnolia is hardy in USDA zones 4 through 9. Another hybrid, Loebner magnolia (Magnolia x loebneri), hardy in USDA zones 5 through 9 and growing 20 to 30 feet tall, produces star-shaped flowers. When bruised, the tree's stems have what Dirr described as a sweet fragrance.